The town of Wilderness, set on the Touws River estuary, is fast developing with a plethora of luxury holiday homes lining the cliffs and hills along the coastline and river. It is a beautiful spot surrounded by a chain of freshwater lakes. Encompassing the Wilderness National Park with about nine miles (15km) of inland waterways, it serves as a fantastic destination for paddling adventures. There are some wonderful hiking trails and canoe trips offered by the park wardens, and numerous accommodation facilities are available. The coastline of Wilderness is idyllic, with some lovely rock pools exposed at low tide and long swathes of sand for sun-bathing. The sea is pleasantly warm in summer but visitors should note that although swimming can be glorious, there are sometimes dangerous currents along this coast. In season, there are almost always lifeguards on the main beach. 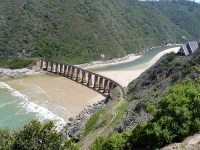 A favourite destination along the Garden Route, Wilderness is close to a number of other popular coastal towns and villages, including Knysna and Nature's Valley. Also nearby is the city of George, which has urban conveniences such as malls, shops, and cinemas.